What officer gets fired for warning people not to drink and drive? Just one and his name is Scott Chaloner. 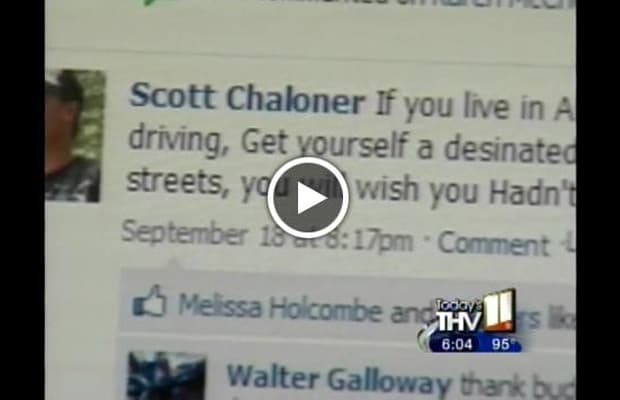 The cop offered some advise to intoxicated drivers hitting the road, posting on his Facebook page: "If you live in Alexander and you're drinking and driving, get yourself a designated driver. If you don't and you're out on the streets, you'll wish you had. just a word to the wise." Shannon Hills Police Chief Terry Mullenax claimed the message jeopardized a DUI checkpoint and was a violation of the department’s code of ethics. Badge taken, pink slip issued.